This week I will be sending a few postcards from the village of Saint Jean on Cap Ferrat, a tiny peninsula near Nice in the South of France. I wake up to the sound of rain. It’s raining, says my wife helpfully as she sees me stir. My mind switches on and starts building a list of all the things we won’t be doing today. It’s sunday too, so nearby Nice will be dead as well. With two ado’s, as they are referred to in France, family entertainment is going to be tricky. I’ll make some tea, I say. That’s my job and the answer to many of life’s toughest setbacks. Cap Ferrat is one of France’s pearls. A small peninsula with a light house, a small village with a baker, a café and a small port. It has beaches and a beautiful walkway around the cape. It is also host to the most expensive real estate in the world. The sort of place where Mr and Mrs Brad Pitt will visit by helicopter to find a quiet holiday home. Its outrageous house prices has protected it from the disease that has ravaged big stretches of the Côte d’Azur: Apartmentitus. Instead, the entire peninsula is covered in large private domains with gorgeous houses and gardens. These have become ‘patrimoine’: landscape, architecture and culture that needs to be respected and sometimes protected. Although these properties are in pristine order, they are also abandoned for most of the year. The Pitts and friends have better things to do then to sit here by their pool. So when you go to the village café, you’ll meet the true locals. What horror, it eez a disaster! Pierrot, the elderly port master, punches his Nice Matin newspaper. Apparently his football club lost against Monaco and dropped another two rungs on the league ladder. A couple of other men stand around him, mumbling sympathetic noises. It is bad, that. Even the waiter stops, full tray held high, he commiserates. Then, Nicoletta walks in. The young Italian owner of the news agents next door and floats past the little crowd of men. She has a dangerous glint in her eye as she bends down to Pierrot and whispers in his ear. Pierrot swears and bangs his fist on the little round table. His coffee cup rattles and the men scatter, laughing. A couple of yachties walk in and head for a table by the window. Two Americain coffee and you have the bread? The waiter ignores the german idiom. Deux Amercains and tartines, of course. Tartine. Another french institution. Half a baguette bread sliced long ways, served with butter and jam for spreading. They even have a verb for that: tartiner. Although tempting, you are not allowed to put the two halves together because then it becomes a sandwich. A foreign invention. To do that would be so, eh, so… The French have no word for that. How’s that tea coming along? What? Ah, yes, the tea. The great thing about rain is that when it stops it’s, well, great! With this thought I try to convince my squelching feet that it’s not so bad. My jeans are wet and the inside of my anorak is feeling decidedly damp but I will have a pep talk with her later. It real rains heavily now. The wind doesn’t help. The sea is restless. Larger than usual waves crash into the jagged rocks of the cape. Explosions of white water, five, six meters high. There is no horizon. Grey sea and clouds mix into wide streak of primal wetness. Through the noise of that violent water, I hear the distant thumping of rotors of Heli Air Monaco ferrying people between Nice and Monaco. This too, is Cap Ferrat. There must have been a time when ships sailed into the rock faces of the cape. I shudder to think what it would have been like. If you were lucky enough to survive the destructive crash, you could never leave the water alive. The thrashing waves would beat you to death on the sharp rocks. Better not fall off the path, I think, as it occurs to me that the sign “danger, coastal walk closed” was perhaps for me too. The family entertainment translated into a visit to the Henri Matisse museum in Nice. Fascinating to see how he evolved from a still life of old books to his extraordinary drawings, sculptures and cut outs. 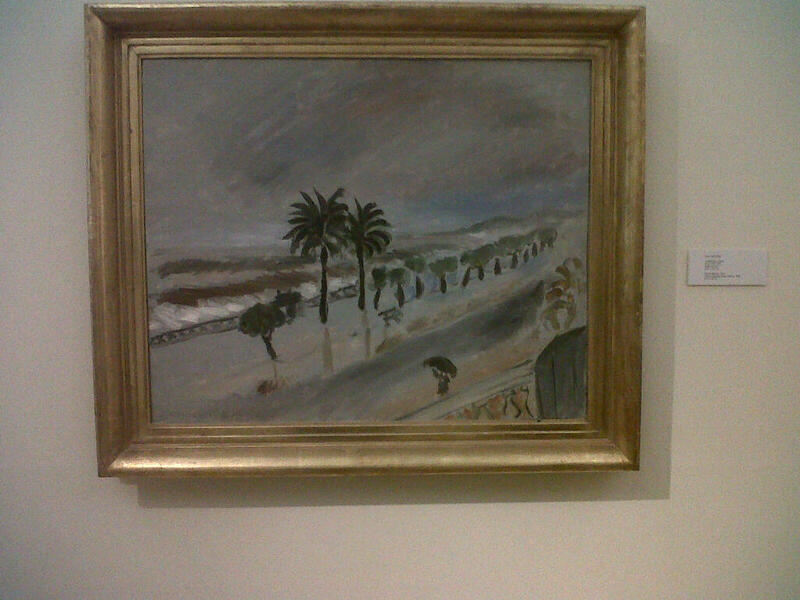 All went well until I saw his painting of a stormy Nice, view of the Promenade Anglaise. There is no escape today.